S.T.O.R.M.’s analysis in this case is fundamentally sound, but it offers little insight on what this “resistance work” is. What makes this “resistance work” different from the work of revolutionary movement? Or, as A. Weaver pointed out, since the spark for the Spanish Revolution was defense against the Fascists, does that mean that the Spanish revolution was “resistance work” or, as I call it, a defense movement? First, we must understand what makes a moment revolutionary or not. It is a fundamental question on analyzing the material conditions of a period in history. The predilection of some crude Marxists to make history the agent of revolution is as problematic as the view that equate the revolutionary process to an explosive voluntarism, with will alone becoming this overwhelming passion that would bring down the State apparatus. Revolution is the convergence of certain material conditions in society and the will of those historical agents who act in that situation. It would be preposterous to claim an exact formula with which we can determine if the moment we live in is a revolutionary one or not. Much of that analysis is made in hindsight, and tends to be heavily influence by a perceived victory or defeat, for example, the late-sixties were not a revolutionary period because they did bore a revolution. However, a particular factor that we must always take into account is the power of the alternative institutions of the class in a confrontation with the status quo. Without powerful and vibrant institutions that channel the collective power of the class, and rival in power and influence the power of the State, true revolution is impossible. That situation, referred to as dual power, is far away from our reality – which means no matter the material conditions we are not faced with a revolutionary situation but with a reactionary one. Moreover, the power and the institutions of the class directly influence the material conditions of their time period. If we accept that as part of our analysis, then the question becomes how do we move from this reactionary situation into a revolutionary one; and if we understand the need of building the collective power and the alternative institutions of the class, then our route is clear. We must work to build the consciousness and the institutions of the class. That’s the work of the revolutionary today. Gramsci’s theory of war of position and war of maneuver refer to how we understand revolution: as a process of change or an explosive moment. As a process of change, as a protracted struggle, the revolutionary process is not a direct, straight line to communism. It is a pained, back-and-forth struggle between the State apparatus and the institutions of the people. Fair enough. The concept of war of maneuver helps us comprehend the basic dynamics of the process of change; it brings to the fore the question of the role of the ideological field of class-struggle and how, in a very vague way, we move from the ideological state we are in to the ideological state we want to be in. But for me, many questions, crucial questions, remain unanswered. More importantly for this discussion, what is the practical actions that need to be taken by the active group of revolutionaries to move the historical process forward? It is not a question around the role of social movements or the class, but what is the role of the conscious revolutionaries aiming at a revolutionary reconstruction of society? Gramsci tried to address that in “The Modern Prince”, but his analysis is a vague reassertion of the Leninist argument for the party of professional revolutionaries. He differs from Lenin on that Gramsci view a bigger role for the organic intellectual of the class in the party than Lenin, who views the socialist consciousness as having to be brought in from outside of the class. Its a very limited and elitist view that has brought us already enough bitter fruits in the past. Anarchists historically held the view that the role of the conscious revolutionaries, whether they originate inside the class or outside of it, is that of agitators or catalysts. They do not wish to have the people “be forced to be free” as Rousseau would have it, but have “people to free themselves” like Malatesta would say. Not to downplay other differences, bu this may be the seminal difference between the anarchist revolutionary organization and the Leninist party. Since we do not believe that people need to be led to the revolution by the party, we have been accused of “spontaneism” by Marxists. Yet, anarchists that do not believe in spontaneism and aim at a structured approach to the anarchist involvement in the social movement tend to be derided as Marxists or bolsheviks. One group of anarchist that suffered the most of these kind of accusation were the members of the Dielo Trouda group, and more specifically, Nestor Makhno and Piotr Arshinov. Criticism of their personal acts notwithstanding, the group’s “Organizational Platform of the General Union of Anarchists (Draft)” talks about the role of the anarchist revolutionary organization – the wrestle for the “leadership of ideas” inside the popular movements. The idea of leadership of ideas is left vague and has been a place of criticism against the Platform. It is however, a crucial component of an anarchist revolutionary strategy. It is not about imposition of anarchist views on social movements, but about arguing for anarchistic values inside them. Social movements, to remain healthy and vibrant, must be politically open. They must be a reflection of “the-class-for-itself”, a collective with understanding of their needs and aspirations and ready to fight for it. Movements cannot be monoliths attached to one political ideology or another – even when they subscribe to one political ideology, tend to have different interpretations of said ideology. That is the nature of social movements because they enhance the best in their participants – critical thinking, challenging authority and sense of individual and collective power. Solidarity and discipline are not enemies of democracy, but many times leftists tend to see dissent as a quality to be squashed. I mean, it’s all and good to challenge the boss, but never challenge the party line. Conformity is the death of any social movement. When it gets stuck between the five “brilliant ideas” of their “glorious leaders”, movements not only reproduce the structure of the State but they also miss out on a plethora of solutions to the problems they face that could come from the active participation of their members. Hence, to belittle the socialist ideology in any way, to turn aside from it in the slightest degree means to strengthen bourgeois ideology. There is much talk of spontaneity. But the spontaneous development of the working-class movement leads to its subordination to bourgeois ideology, to its development along the lines of the Credo programme; for the spontaneous working-class movement is trade-unionism, is Nur-Gewerkschaftlerei, and trade unionism means the ideological enslavement of the workers by the bourgeoisie. Hence, our task, the task of Social-Democracy, is to combat spontaneity, to divert the working-class movement from this spontaneous, trade-unionist striving to come under the wing of the bourgeoisie, and to bring it under the wing of revolutionary Social Democracy. The sentence employed by the authors of the Economist letter published in Iskra, No. 12, that the efforts of the most inspired ideologists fail to divert the working-class movement from the path that is determined by the interaction of the material elements and the material environment is therefore tantamount to renouncing socialism. The Platform’s concept of the leadership of ideas has been likened to a Leninist vanguard, but if not from malice, the argument seems to come from a place of half-knowledge. Any ideological group seeks a leadership of ideas in its field – be they religious, scientific or political. Those who are passionate about their ideas want to share them. That anarchists should try to have a leadership of ideas – make their ideas prominent, even dominant inside movements. It is however, paramount that anarchists fight for the democratic process and spirit of movements at all times. We, who wish that “the people liberate themselves”, must advocate for and defend the elements of social movements that foster the realization of people as full human beings – critical thinkers, anti-authoritarian, self-confident human beings. This cannot happen without real space for dissent and debate inside the movements, for people to organize themselves in ways that may not be the desired ones by anarchist organizers. One thing we must be aware is that challenging “what people want” is a fundamental part of organizing, however. The role of the anarchist organizer is to challenge the preconceptions of what is possible, of the one single way of doing things, and shatter the paradigms set on by capitalist society. That is the line that needs to be wlked on all the time – fostering critical thinking and respecting dissent in one hand, and offering critique and challenging attitudes that come from the bourgeois ideology. To expect that people “already know everything” is naive and self-deceptive. People can see only inside the paradigm that have been reared in. But for that to become a excuse to destroy dissent will never bring the liberation of the working-classes. In that context, we must understand leadership of idea as a struggle for hegemony between authoritarianism and self-actualization – between the values of obedience and critical thought. The left tends to charge at people with what to think, but it is often scared of thought. The leadership of anarchist ideas is the leadership of the ideas of socialism, solidarity and freedom in the broad sense, and the ideas of direct democracy and critical involvement by working people. We believe that direct democracy and critical thinking are indigenous to every popular movement and that it is obedience and hierarchy that are brought from without. But those seeds are planted in people’s mind way before any particular organization tries to strangle the movement. That being the case, the anarchist organization must seek to raise the questions and to challenge those authoritarian and hierarchical tendencies. I know I barely said much in this post, but it is enormous as it is, and I’ve been working on it for a long time. I’ll just post this here now and get back to it. ... to something like this (Kwangju, 1980), with real possibility of winning? There is not going to be a General Strike in Oakland. For radicals who have been around the proverbial organizing block I would urge caution to avoid falling into the role of being the left naysayers of the movement. Just as under capitalism “all that is solid melts into air, all that is holy is profaned”, in times of upheaval and crisis events that never seemed possible suddenly become so. People who are unpoliticized or only have nascent consciousness become radicalized and people who are already politicized begin to identify with revolutionary politics. The lack of organic connections to more politically defined political militants leaves these newly radicalized layers to flail in the wind and take many political missteps, grow cynical, or be swept into the first organization that seems to offer a ready baked formula for radical change. There is a tremendous amount of energy in Oakland right now. Walking downtown, you can feel it in the air: The police walks on a different kind of edge, the suits walk scared, the politicos hide their faces from the camera and sneak from the back of City Hall. There is a flurry of activity, from leftists to unionists to community activists are spreading the word about the strike action and engaging people in conversations about our current situation and capitalism. The energy is building up and the word is on the tip of everyone’s tongue. Unions are, in different levels, trying to get their people out there or at least symbolically supporting the strike. Something will happen, it will just not be a General Strike. 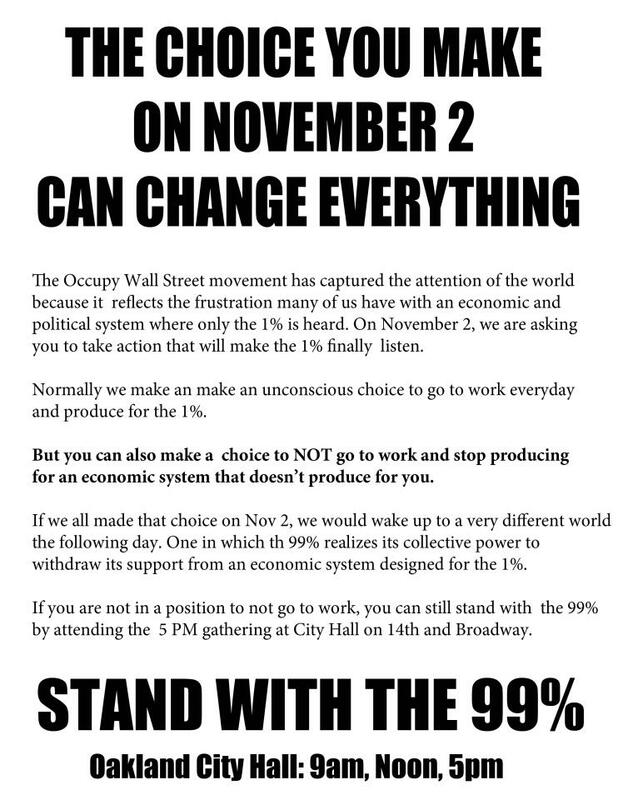 It will not be a General Strike because, for many people, the occupy movement still something they experience through the television. There is sense of them over there (people camping out and going to rallies every night) , and us here (people going to work every day and being spectators). The argument that “in times of upheaval and crisis events that never seemed possible suddenly become so” fails to take into account that these times of crisis and upheaval are generally escalations. Although build up has been happening, it has still not broken the barrier of alienation – people are still isolated and terrified of their bosses, people are still disconnected. The call for a General Strike might have be a hasty one (specially since it only gave one week for preparation and build-up), but it has forced the issue of participation in capitalism and the power of working people to change things to the forefront. It has forces radicals inside the unions the examine the work that they are doing and take a stance – either this is revolutionary work, and my job as a revolutionary is to push my union to participate on this, regardless of bureaucracy, or being in the union is just my day job and that’s the end of that. It has forced the union to take a stance in supporting the action or be deemed irrelevant. It has shattered the confidence of many people in the electoral route for change, and it has instilled in people the confidence that they can do things for themselves. It must however, be more expansive. The General Strike is an action of sharp contrasts: you either strike or you scab. That sharp contrast is good and crucial – but at the level that Oakland is right now, it is paramount that other venues open for people to participate. 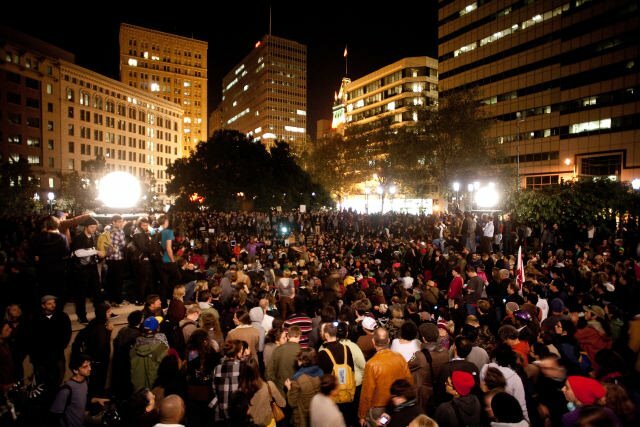 We must broaden the base of people who participate in the Occupy movement, and use this event as a spark to generate even more organizing and agitation outside Oscar Grant/Frank Ogawa Plaza. Hearing from a comrade that she was one-upped by a neighbor in door knocking in her street is one of those signs that the sentiment and energy is seeping through the cracks and building up. This is what we need. This is what we should be doing, and what many are doing. It is really not productive to get caught fantasizing about a anarcho-syndicalist general strike and be tied to the exclusive project of stopping production. It is a lot more relevant and revolutionary to try and break people from the patterns of alienation, even if just a bit more, and have them engage in mass action, be strike mass action or not. All that being said, I can only ask one thing of my beloved adopted town – prove me wrong, and shut down the town! Patricia Amorim. First female President of Flamengo and of any major Brazilian club. … And before celebrating, we must talk of serious matters. For some stupid reason, Flamengo’s Presidential election was held the Monday after the last game of the season. So instead of being here talking about the Greatest of Events, I’m here talking electoral politics. Like most major clubs in South America, Flamengo is a multi-sport athletic association, not privately owned but run by an elected official, normally in three-year terms. Patricia Amorim, a former swimmer for Flamengo, surprisingly dethroned the situation the day after a major victory for the football team. Patricia had already been part of Flamengo’s administration for over three years, but she was forced to resign from her position as Olympic Sports Vice-President during a major financial crisis in the club earlier this, that left the basketball team with over six months of overdue salaries, not to say about other sports like swimming and gymnastics and the staff. Delair Dumbrosk, who was running for the situation, was the Executive Vice-President at the time, and has been running the club for the great part of this year, due to President’s Marcio Braga chronic hard condition that had him in and out of surgery. 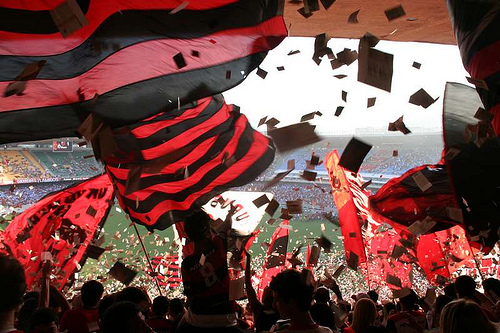 His victory was given as certain in case of a Flamengo title. He shunned the debates and other forums and run on a “you don’t wanna risk changing things now” campaign. It didn’t work. The problem is that Patricia, a member of Rio de Janeiro’s city council, ran a very “political” campaign, full of nothing and some more nothing. I listened to the debate for 2 hours and not once a heard a single concrete proposal coming out of her mouth. There was a lot of buzzwords like “professionalism” and “21st Century”, but nothing relevant. Not that the other candidates were much better. Pedro Ferrer sulled, Clóvis Sahione screamed like a madman about nothing important, Lysias Itapicurú was as charismatic as John Kerry (and as relevant, too). Plínio Serpa Pinto did present some ideas, some good, some bad, but all very concrete. If I could vote, he would have been the one. But Patricia was the one with the most supporters. I got to give it to her, in the minefield that is Flamengo politics, she had always been able to aggregate instead of divide. Now the question is if that was because she wasn’t in power. There is a lot of fear that she will sink football, because she is more worried about the olympic sports, her home base. Or that she will bring us something akin to the terrible disorganization and corruption of the 90’s, when, from being a club with a budget that ran on a surplus, we became a club with a debt of over 170 million dollars. If any of that is substantiated, I don’t know. I am, surprisingly, giving her the benefit of the doubt. She has three years to prove herself. Godspeed, Madam President. A nation is in your hands. The Black Panther Party “survival programs” instilled terror in the U.S. national ruling class all the way to the head – at the time, Johnson and Nixon, and the fierce hand of J. Edgar Hoover. While many in the Left like to sensationalize the armed and bellicose aspect of the Black Panthers, it is really telling that their survival programs ranked so high in the threat scale in the minds of the ruling elite. A strategy of building a long-lasting movement able to wage a protracted struggle against the State must encompass both a element of destruction as well as an element of construction. Not only must we bring out the contradictions of capitalism to the forefront, we must also show that those contradictions and problems that capitalism cannot resolve are not unavoidable but can be resolved through collective means and an non-capitalist framework. Institutions are based on needs, real or perceived. Institutions like the State, police and “the free market” are perverted creations that satisfy needs like the organization of things, safety and delivery of goods and services. Our argument should not be that those things are not important, or that capitalism does not address those issues, but that they can be addressed better under a different system, in a more equitable manner so all will have those things, without sacrificing our freedoms and forgoing a fulfilling life. That we cannot have “pursue of happiness” under capitalism. Constructive and destructive – our program must be both. Not in some future communist society, but presenting an inkling of what this future might look like and building today the capacity for self-organization and self-defense of the working-classes. The BPP’s “survival programs” had a two-pronged aim – to deliver where the State and capitalism was lacking, and as a extremely successful propaganda tool. The first aim we must put in the forefront, the second aim is a consequence. These acts must be, however, built on the premise of collective action, not on revolutionary charity. People must be engaged not just on receiving the services but also in delivering it. As anarchists, we must built on people the idea for self-sufficiency and expose the waste of capitalism and the superfluousness of the State apparatus. What does that mean? Programs like Copwatch and Food not Bombs are not revolutionary or reformists in nature. Neither is a strike, a riot or a a march. Who is engage in it, and the proccess in which they are engaged is what makes an act revolutionary or reformist. What we must be for, then, is the expansion of the creative capacity of those inside the movement – to create a space for reflection and analytical development for those that in general do not have such space or that are led to believe that they do not have such capacity. We must be destructive towards the outside, constructive towards the inside. It is not the victory in and of itself that matters (although that is also very important) but that the participants have ownership of such victories. It has been fashionable for a while, for example, to praise SEIU as a paragon of defending workers, because they engaged in highly successful organizing drives. They were giving the union movement something it had lacked for a long time – victories. Yet many never looked at how those victories were achieved and the price that the labor movement payed for those victories to be achieved. The SEIU model of corporate unionism spread like a wildfire in the minds of many “progressive” elements of the union movement. If now the monster is being unmasked to many, it has to do a lot more with Stern’s own statements and power-grabbing than with a clear analysis of the situation. I’ll be visiting this subject again later. This text is long enough for now; but the situation of working people in the U.S. is dire – much more now due to the “crisis”. Much like when the BPP create its survival programs, the need for programs that address the open spaces left by the State is ever present. While we must be in the defensive stage of the revolutionary struggle, any ground left open must be taken and held on to. Maybe I’m suffering from Machete408 envy, so this text is on the long side. Bear with me. Splits, re-joinings, trusteeships and grand standing, Roselli vs. Stern, Stern vs, DeMoro, Sweeney vs. Stern, Wilhelm vs. Raynor. Each one of them claiming to be the one and only salvation to the Labor Movement. More and more, the union movement seems to be trapped on a web of compromise and disinterest. If in one hand the union movent is on the downturn, the Labor movement seems to be on a slight upswing. The Coalition of Imokalee Workers, the Great American Boycott in 2006, the Colibri Workers, and the sit-in at Republic Windows are just examples of what is brewing in the Labor Movement across the country. All the while, the Union Movement is concentrated and bogged down in the Employee Free Choice Act. I’m not going to go into EFCA. My friend Adam has an alternative view posted on his blog about EFCA. But what is the prospect of a rejuvenation of the Union Movement; more importantly, what can be done so the union Movement can rejoin the Labor Movement? For answer, we must look at what the Labor Movement is. The Labor Movement is a social institution. It is a force that is part of people’s lives , and is part of the discourse of people’s lives. It addresses people’s needs in a way that requires them to get involved. A church is a social institution because it is part of the lives of the parishioners even outside of the church, it requires participation and guides the politics and ideas of its members. The Labor Movement, as a social institution, is the same. It is an institution of migrant workers, women workers, queer workers, waged and unwaged workers, union and non-union workers, for migrant workers, women workers, queer workers, waged and unwaged workers, union and non-union workers. The Union Movement started as part of this Labor Movement. At times, it was the most militant and impressive part of that Labor movement. In those moments, the Union Movement was also about more that winning wages and contracts. It was ebbed on peoples lives. It fought for reforms that would benefit not just the members of a union or federation, but the whole working-class. The eight-hour day in the United States. The Spanish Civil War. Solidarity in Poland. CUT and the Metal Workers fight against the dictatorship in Brazil. COSATU in South Africa. Bill Fletcher’s book “Solidarity Divided” starts with an anecdote about a meeting between leaders of COSATU and SEIU. When an SEIU delegate remarked that the role of the union is to fight for its members, a COSATU representative replied that the role of the union is to fight for the interests of the working-class, which sometimes can conflict with the immediate interests of its members. To do that, the Union Movement must be a living, breathing part of working-class struggles for a better life. The Obama administration has made no move to change the draconian immigration laws of this country, and continues to promote, through ICE, the destruction and separation of people from their loved ones, through raids at people’s homes, work and schools. While labor may be all too willing to pass a resolution or two about immigration, more is needed. We must become decisive players in favor of migrant workers, educating our membership about the crucial connection (not just in a moral level) between the condition of migrant workers and the condition of non-migrant workers. We must become visible defenders of the migrant worker community, by promoting and enforcing sanctuary-city laws, by creating “solidarity-piquets” against raids, by organizing with the migrant community against right-wing back-lash and govermental policy. As the crisis of international capitalism deepens, more and more people are seeing themselves out of work. While everyday we hear more and more about white collar-workers and professionals that are losing their jobs, groups that historically have suffered from high rates of unemployment such as Blacks and Native-Americans, are in an even more precarious situation. Subemployment (petty trading like selling bootlegs on BART or in the streets, part-time or temping) are becoming more and more endemic. Ultras are to football what Unions are to capitalism. The Ultras are our last good chance of returning the game to its real owners: the fans. 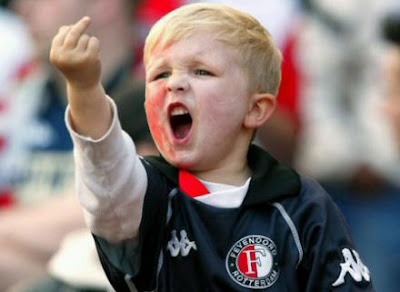 The “professionalism” that has infected football since the ’40s has slowly eating away the soul of the beautiful game. Now everything is about results. Now everything is about money. Now, everything is the nightmare dreamt by Havelange’s sick, sick mind.Granted, many more sick minds were necessary to transform football and destroy its popular character. The destruction of the terraces and the introduction of individual chairs (in Brazil, having it being mandated by CBF), the ticket price going through the roof, all this combined with fascists organizing in the stadiums of Europe, was making the pitch a very undesireable place to be in. Many Ultras, specially in Europe, have been in the forefront of anti-fascist organizing, with an incredible success (see, white people, why don’t organize against racism in the white community?). They have been fighting the process of bourgoeisification of the game, even going so far as to create independent teams, like the United of Manchester F.C. or A.F.C. Liverpool.